Rowley Town Hall is located at 139 Main Street, Rowley, MA 01969; phone: 978-948-2705. Photo: Thomas Lambert House, ca. 1699, 142 Main Street, Rowley, MA. Listed on the National Register of Historic Places in 1990. Photographed by User:John Phelan (own work), 2010, [cc-by-3.0 (creativecommons.org/licenses/by/3.0)], via Wikimedia Commons, accessed September, 2017. A group of Puritans from Rowley , Yorkshire, England, led by the Reverend Ezekiel Rogers, a dissenting clergyman, founded Rowley in 1639. That so many early settlers were from Yorkshire made the Town unique in New England, as it was the only town where "Yorkshire folk predominated." The group sailed to the new world on the "John of London," bringing with them the first printing press to be used in America. This was the famous "Daye Press" which was eventually set up in Cambridge. After the addition of the middle section of Plum Island in 1649, Rowley was bounded on the north by Newbury, on the east by the Atlantic Ocean, on the south by Ipswich and Salem, and on the west by Andover and the Merrimack River. The land area of Rowley originally included the Towns of Boxford, Bradford (part of Haverhill), Georgetown, Groveland, and a part of Middleton. Primarily an agricultural town at first, the Town gradually developed an industrial base, manufacturing products such as shoes, boots, heels, flour, lumber, wagons and wheels. 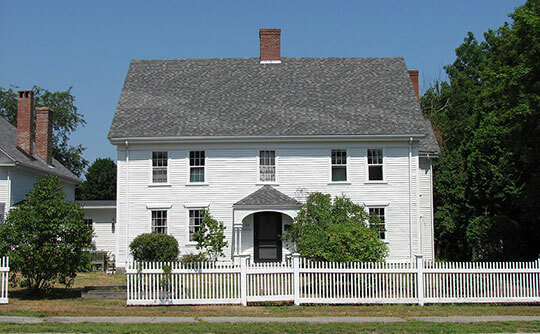 The King Grant, Bradstreet Farm, owned by the Humphrey Bradstreet family since the 1600s, is the nation's second oldest working farm to be continuously owned and occupied by the same family. Although lacking a harbor, Rowley was at one time home to a shipbuilding industry. Since many of the Town's earliest settlers were weavers and clothiers, the first fulling mill in the colonies was established in Rowley in 1643. As the supplies from England often failed to arrive, the fulling mill was established out of necessity, but it soon grew in significance, as it was the only one existing in the colonies for a period. This marked the beginning of the textile industry in the colonies, and eventually proved to be a contributing factor to the War of Independence, as the mill was perceived as a threat to England's dominance in supplying wool to the colonies. Town of Rowley, MA, Rowley Master Plan Final Report, 2003, www.townofrowley.net, accessed September, 2017.